Why Security First, and Why Now? The Palestinian issue has generated a veritable wave of new diplomatic initiatives. What does it all mean? The report of the quartet severely attacking Israel and the Palestinians alike; the French sponsored international conference that convened this week (without us); Egyptian President el-Sissi’s offer to facilitate an agreement with the Palestinians within a regional framework (to which Prime Minister Netanyahu has responded positively); and the persistent buzz about the possibility that right after the US elections, President Obama will permit (if not promote) a binding UN Security Council resolution – all these indicate that not only we but many other eminently worthy (and some less worthy) players in the international arena think that now is the time for change. Meanwhile, in the midst of the recent wave of terror, a noteworthy group of people got together. With some 6,000 cumulative years of military and security experience among them, untainted by political motivations or the desire for personal gain, united in a common bond of commitment to the security of the Jewish State and the Jewish People, they all shared the same insight: passivity is not an operational plan. Commanders for Israel’s Security (CIS), as the association they founded is called, believes that to break out of the current impasse, Israel must be pro-active rather than allow itself to be dragged along by events, by third party initiatives or by extremist on both sides. The important question is not whether Israel has a negotiating partner but what action we can take independently. Merely shifting responsibility on the Palestinian side, as justified as we may be in doing so, achieves nothing. The situation calls for an independent Israeli initiative that combines security measures and civil economic steps while dispelling ambiguity about Israel’s intentions — all without preempting future options. 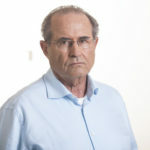 The Security First initiative is based on the following assumptions: that a final status agreement on two states is currently not feasible; that terror cannot but stamped out by force alone; that a continued diplomatic stalemate will lead to further rounds of violence and a deterioration in security; and, finally, that Israel is strong enough to launch an independent initiative that will improve our situation locally, regionally and internationally. The plan calls for comprehensive security measures dealing with Gaza, the West Bank and Jerusalem. It is essential that the plan address all fronts so as not to allow escalation in one place to ignite unrest in other areas as well. The situation on the West Bank requires ongoing IDF deployment until a final status agreement is reached. An essential component of the plan is completion of the security fence, a move that will dramatically enhance the security of Israelis living within the Green Line as well as 80% of those living on the West Bank, including East Jerusalem. The Israeli government had initially decided to build a 717 km fence. To date, only 645 km have been completed (around 60%). Terrorists and illegal residents (numbering some 50,000 as of today) regularly infiltrate through gaps in the fence. Another aspect of the plan deals with roads. 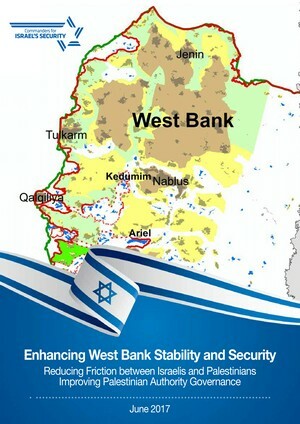 In order to reduce friction between Israelis and Palestinians on the West Bank and increase security, safe transportation corridors must be set up for Israeli traffic, movement must be restricted on certain roads and alternative routes established elsewhere. Reducing points of friction will make it easier for the IDF to maintain security for Israelis living east of the security fence. Routine security operations must be enhanced, checkpoint must be upgraded along the route of the fence and the struggle against infiltration intensified. At the same time the number of work permits issued to Palestinians must be increased so as to encourage legal and supervised employment in Israel. 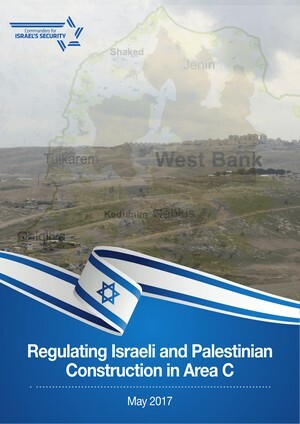 Israel will launch a development plan to promote economic growth and job creation east of the security fence. The plan will include, among other things, agricultural development, easing restrictions on the transport and export of goods, renewing the operation of the Joint Economic Committee (JEC), building Palestinian industrial areas adjacent to the fence and promoting the construction of a new Palestinian city. 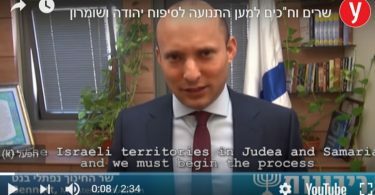 A third leg of the plan calls for Israel to remove, once and for all, ambiguity about its intentions regarding the future of the territories. This will be achieved by means of a declaration by the government of Israel stating its commitment to a final status agreement based on the two state solution. Those who have reservations about the plan should be reassured by the fact that Israel will not withdraw unilaterally from the West Bank, nor will the IDF relinquish control over any of the territory. It cannot, therefore, be construed as a victory for the extremists. The CIS proposal contains a chapter dedicated exclusively to the question of Jerusalem. This section contains a three pronged formula involving security, economic and political measures. It calls for no Israel concessions, and it requires no partner in order to implement. The security section advocates completing the security fence along the Jerusalem envelope, vigorous law enforcement in the neighborhoods and villages of East Jerusalem and scrupulous maintenance of the status quo on the Temple Mount. The civil-economic part of the plan calls for the administrative separation of East Jerusalem by establishing a municipal umbrella authority for the neighborhoods of Palestinian Jerusalem, operating as a separate municipal framework within the city of Jerusalem; drawing up a master plan for the accelerated development of Palestinian Jerusalem; and the establishment of a fund with Palestinian, Arab and international involvement. The residency status of Palestinians in Jerusalem will not be affected, but consideration of new permanent residency requests will be frozen. Likewise, Israeli citizenship will no longer be granted to permanent Palestinian residents of East Jerusalem. The residency status of Palestinians living outside of Jerusalem will be protected (until a final status agreement is reached) in order to encourage relocation to the West Bank and reduce overcrowding. On the political level, the Israeli government will declare that it will maintain ongoing control over the neighborhoods and villages of East Jerusalem on a provisional basis until a final status agreement is reached. We believe that these measures, taken together, will have an immediate, moderating effect on both the city and the Palestinian Authority, while reducing international pressure on Israel. The Gaza situation is by far the most complicated, not least because the Hamas, which rules the territory, is in a state of conflict with the Palestinian Authority, Egypt and Israel; is defined as a terrorist organization by many countries, including Arab states; and either refuses or finds itself unable to confront extremists operating out of the coastal enclave. Despite the fact that Israel evacuated Gaza to the last soldier and settler, as long as Israel determines who and what enters the Strip and controls access by land, sea and air, the international community will not free Israel of responsibility for the humanitarian situation there, and will continue to see us as an occupying force. The supply of water and electricity, as well as the transport of food, medicine and all other goods to Gaza depends exclusively on Israel and its security policies. 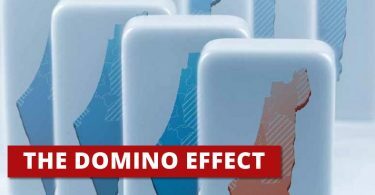 Absent a win-win formula benefiting both sides, new rounds of fighting can be expected, and the Gaza Strip will become unfit for human habitation in the near future. It is therefore essential that we take the following steps: increasing the number of supply trucks that enter the Gaza Strip; significantly expanding the sources of energy and water that supply the Strip; reducing unemployment (Gaza has the world’s highest unemployment level in general and among young people in particular); increasing the number of permits issued for work in Israel; extending the area where fishing is permitted – even if this means overruling the Navy’s reservations on the matter; examining the matter of sea access for Gaza, whether by establishing a port, a floating dock or a permanent ship lane – all subject to Israeli security control and in coordination with the Palestinian Authority. Singapore, as small as it is, has managed to achieve a strategic balance with its two large neighbors, Malaysia and Indonesia. Though Gaza is light years away from such a scenario, it still behooves Israeli planners to learn from the experience of others. Finally, Israel must make it clear to the world that, although we will take these steps out of humanitarian concerns and in light of Judaism’s moral teachings, ethical considerations cannot take precedence over the imperative of Jewish survival. When our neighbors and the international community are convinced that Israel is operating solely in order to guarantee its own security, the French, Egyptian and US initiatives will all be seen in a different light.